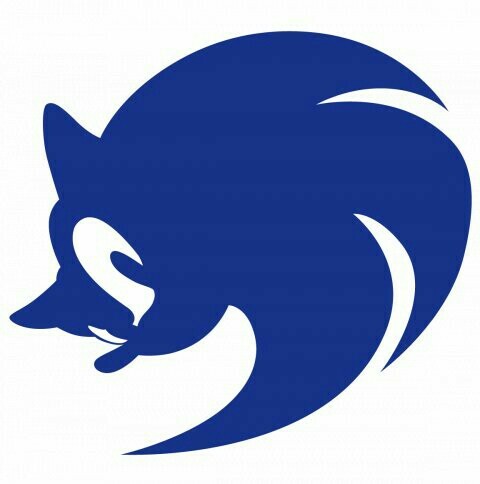 In recent times, Sonic the Hedgehog has been an iconic video game character for both good and bad reasons, particularly when it comes to his many 3D outings. Some rank as the worst games in history, others...well, I can't say any rank as the very best, but they're not all bad. Widely dubbed one of the worst games of all time, let alone one of the worst in the Sonic series, Sonic 06 as it is colloquially known isn't really a game I have to spend ages ranting about - it's infamous nature has rendered many of it's most iconic flaws apparent even to those who've barely played it. Whether it's the onslaught of glitches, poor controls, dreadful level design, or the ludicrous, laughably bad plot, there's plenty of negatives to list if you wanna get critical. It's such a shame that the once mighty blue blur had to sink to such a horrific low, yet even worse that Sega decided to associate this garbage with the beloved Genesis classic with that iconic title. For shame. Undoubtedly another new low for the franchise, Shadow the Hedgehog seemed to be some sort of attempt to make kids feel badass for liking Sonic and win them over through cartoony yet somewhat dark violence - to be honest, it perhaps worked in some ways. I was 10 and at Primary School when the game came out, and certainly recall many of my classmates being won over by the so called badassery of Shadow wielding his epic firearms and blasting away his foes within sinister looking locales. But when you start taking games a little more seriously, this initial wow factor for the narrow minded promptly fades away - Shadow the Hedgehog I'd certainly almost dub as bad as Sonic 06 as, while certainly not as glitchy or unfinished, it's simply a poorly designed mess with some dreadful controls and, once again, a laughably bad plot. There's no harm in trying to stir up an existing formula with new ideas, especially within a spinoff of sorts, but trying to turn it into some sort of poorly structured adult thriller is quite embarrassing for sure. 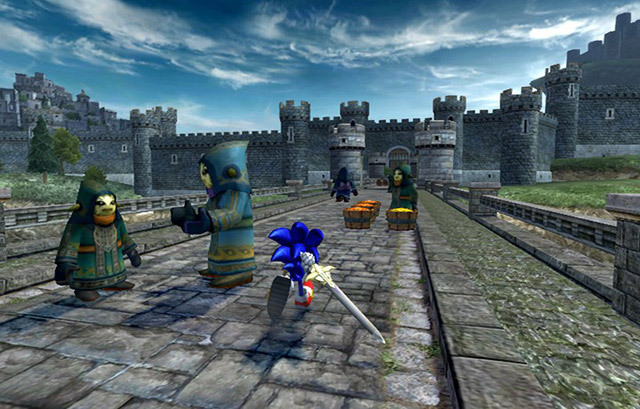 The second entry to what seemed like a planned sub series, Black Knight follows on from 2007's Secret Rings by having Sonic journey into the world of King Arthur, armed with his own sword to hack away at an onslaught of new enemies. It's actually a decent success in terms of presentation, featuring some superb visuals for the Wii, decent voice acting, and a story that, while still a little daft at times, thankfully doesn't take itself too seriously. However, it's this solid presentation that makes the less than tacky gameplay even more of a letdown; whilst Black Knight has some fun moments with a brisk pace, it's often bogged down by a clumsy control scheme that makes the swordfighting tiresome and messy. Players will find themselves waggling the Wiimote like an idiot over and over as strings of enemies block the way, and it's seldom any fun - just exhausting and boring. Such a shame, considering it's newfound potential. It's a game most fans seem pleased with, but I myself find it hard to engage with Sonic Heroes beyond the fresh concept which offers the occasional charm - otherwise the end result is overstuffed with countless frustrations that certainly become major detractors as things continue. Of course, said unique concept is the ability to swap between a trio of characters as you race through each level, and the game features several trios to stir things up even further: from the classic Sonic, Tails, and Knuckles to lesser known (and liked) extras Amy, Cream, and Big, to name a few. It's this concept which works at times and fails miserably at others, leading to a clumsy mess of fiddly platforming with some pretty damn awful controls. I lost patience with the majority of the game far too quickly as a kid, despite wanting to love it with all my heart, and even now I can't find any real reason to enjoy it the same way most do - there's bags of potential, but it's all wasted on mediocre presentation and frustrating, imprecise controls. 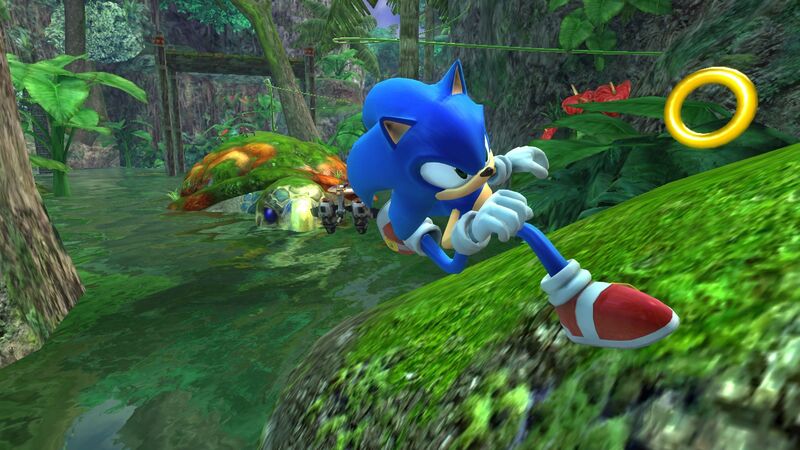 Sonic Unleashed was a frustrating game for many of the blue blur's biggest fans, both the SD and HD versions. 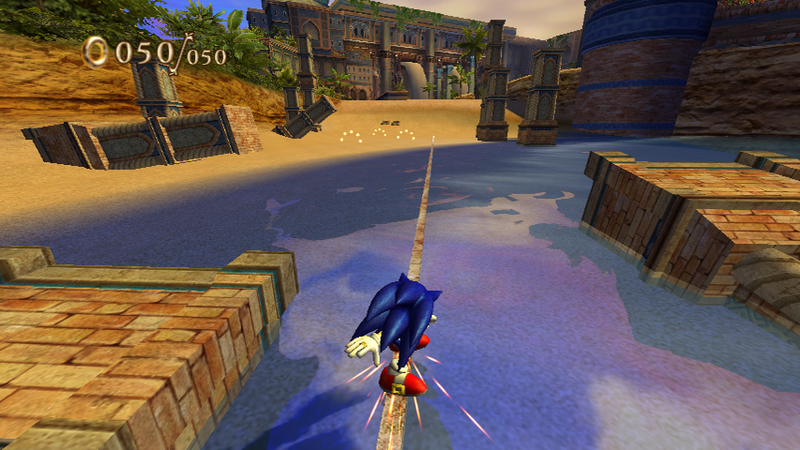 The developers virtually nailed the gameplay style within Sonic's 3D running stages - the pacing, balance of speed and platforming, and seemless shifts from 3D to 2D gameplay made each one an exciting and generally fun experience, and one that most felt was what 3D Sonic was always supposed to be. It's even more of a shame then that these gripping stages have to come to a tragic end to make way for the second gameplay mode: the Werehog. A sort of werewolf like alien hedgehog Sonic turns into come nightfall, the Werehog stages simply feature players continuously beating up an onslaught of generic and uninteresting enemies, hampered once again by iffy controls and bland level design. It's a shame this is also helmed by a very silly story, as once again the 3D Sonic stages virtually nail what we expect - lessons were certainly to be learned here. 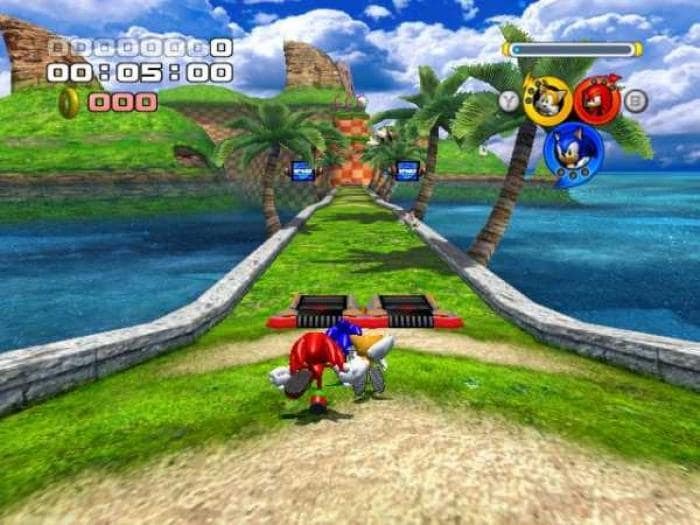 My opinion of Sonic Adventure 2 won't be popular with many - though shimmers of greatness are visible from many of it's fast paced stages featuring Sonic and Shadow, and occasionally the chaotic shootouts with Tails and Eggman, it often feels inconsistent in terms of overall focus, and certainly not consistent in terms of overall quality. Perhaps it's main flaw is simply the incredibly mundane treasure hunting stages with Knuckles and one Rouge the Bat which, despite being laughably easy and over quick in the first game, are overly expansive and thus drag on for far too long; it's this and many of the aforementioned shooting stages that detract from much of the greatness offered by the aforementioned running stages with our lead hedgehogs, though even they aren't free from flaws. It's a solid effort in terms of presentation (not so much story), with catchy albeit cheesy rock music and some decent looking environments, but otherwise I'm not one who can see just why it's hailed as such a masterpiece by many; just a decent pasttime at best. Though many would consider Sonic Adventure 2 the superior game, and while I certainly find both vastly overrated and fairly average, I'd have to go with the original when selecting a favourite - if only because I can play as Sonic, and Tails to be fair, and dismiss the other characters for the most part. Unlike it's sequel, Sonic Adventure features a lineup of protagonists to choose from, each with their own unique structure: speedy thrills with Sonic and Tails, short lived treasure hunting with Knuckles, clunky, boring platforming with Amy, repetitive and overstuffed shooting with E-102, and...fishing? Yeah, fishing for some dumbass frog with Big the Cat. Even Sonic and Tails' stages aren't free from clunky controls and awkward level design, though there's still fun to be had with their brisk pace and decent levels of variety. It's reasonably enjoyable at it's best, and has some great music I won't lie, but can't help but feel dramatically outdated just like it's successor. A controversial choice to put above the Adventure titles, but Secret Rings is a game I ended up enjoying a lot more than many of Sonic's most dedicated fans. It's most notable factor at first glance are the controls; the on rails structure has players holding the Wiimote on it's side and tilting it to steer Sonic throughout each stage, and while this can get awkward no doubt, it's a surprisingly fun way to play. The levels are also structured with this in mind, allowing for a generally smooth experience with it's fair share of unique challenges, though the pace may be abruptly halted now and then with irritating obstacles. It's no masterpiece, feeling quite short lived and occasionally frustrating, but it's refined presentation and approachable gameplay structure make it an enjoyable experience regardless. 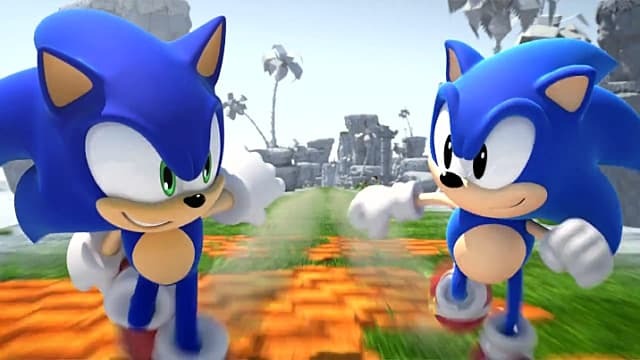 A blend of old and new is what sums up Sonic Generations perfectly - here Sonic meets his past self from the classic Genesis days, and both journey on a quest to stop the evil Eggman once more. Here we have a blend of modern 3D stages coupled with retro 2D ones, each themed after iconic stages from the past and featuring a handful of memorable remixed tracks that equate to one of the best Sonic soundtracks for sure. However, it's also the gameplay that really nails it - the modern 3D stages further perfect an already solid formula, and while it's again not without occasional frustration, it's certainly an experience that superbly captures the pace and agility of what this should be. As for the 2D stages, they to largely master the formula they aim for, harkening back to the old school days outside of just presentation, but also with it's solid blend of speed and intricate platforming. The aesthetic design for all these stages is also masterful, certainly some of the best visual design in a recent Sonic title. After a lengthy slump, Sonic made an impressive recovery in 2010 with the Wii's Sonic Colours, returning to his vibrant aesthetics and fast paced gameplay, whilst also bringing us some refreshing new ideas. Perhaps one of the biggest downsides in modern 3D Sonic games was plots that took themselves too seriously, trying to add excessive drama into an inevitably cartoony premise, but Colours dismisses these faults once and for all and gives us a story that's fun and simple, and certainly not without humour; the dialogue is genuinely funny, and the voice acting is a fantastic starting point for the largely revised cast, featuring the debut of Roger Craig-Smith as Sonic himself. 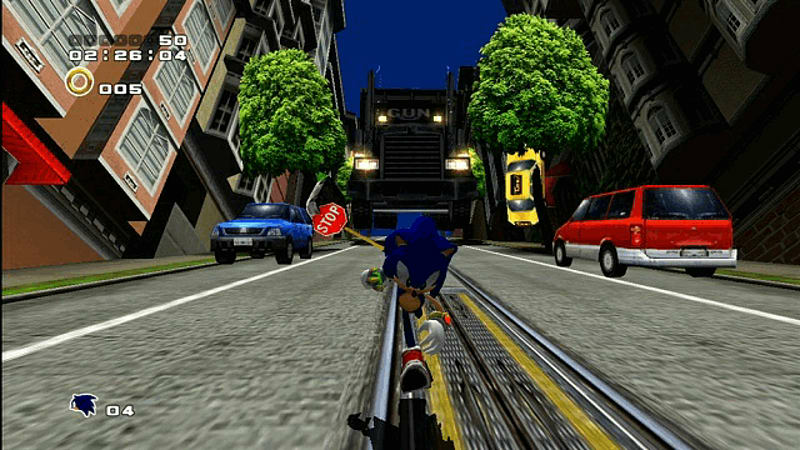 But it's also the gameplay where things are well executed - Sonic finds himself in all manner of vibrant locales that nicely combine relentless speed with enjoyable platforming once more. The Wisps bless Sonic with all manner of power ups that blend nicely into each stage, be it brief hovering or a quick boost, and each level is of course designed very well with these in mind; the end result is a highly refined experience full of variety and, while not without some hiccups here and there, largely absent of the major frustrations that plagued the many Sonic games before it. Modern 3D Sonic is not an easy formula to perfect, but Colours largely nailed it, and certainly ranks as one of the blue blur's finest outings to date. Disclaimer: Haven't played Lost World or Sonic Forces, hence their absence. Sorry!